Letting the music dust settle Saturday's show will rate with my first PJ show as one of the best concerts. http://pearljam.com/setlists/1011/1996/20126/n_charleston_coliseum . Only other shows that compare are The Who and LYNYRD SKYNYRD 1973, The Grateful Dead Englishtown Raceway, and Rolling Stones July 4th 1973, The Police 82, Radiohead Tower Theater 06, and U2 Zoo tour. Band was on full throttle all night. Section 103 front 2 rows great fans to share such a special night. Thanks to the band the Ten Club and Greenville. What a lovely town! I will just echo what everyone else is saying. 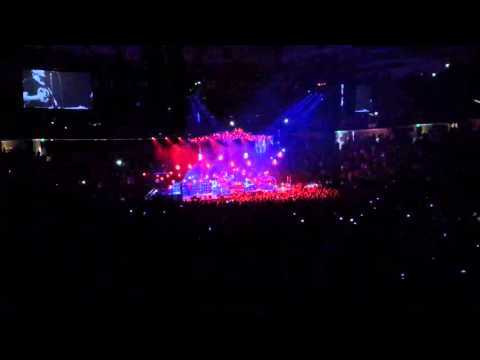 I've been to about 25 PJ shows and this was my favorite. The VS. thing got me so pumped when I finally figured out what was going on. Such an amazing album and even better live. I was second row from the rail on Stones side and it was electric. I usually choose Mikes side because he is so interactive with the crowd, but Stones side was wide open when we walked in at about 6:30. I'm so glad we did. I got some wine from Ed, which absolutely made my night! Stone also seemed to be in great spirits. He was smiling and interacting with a few folks up front. The moment when Ed walked into the stands and hugged the guy with the sign that said "alive saved my life", was one of the most powerful things I've ever seen at a concert. Maybe i identified with him, but it was great to see. The people I met around me were so rad. The Puerto Rican couple, you guys were rad. The married teachers that were right behind us, we're awesome also. Glad you and your wife enjoyed your first GA experience. Only negative on the night were the two girls in white shirts in their 40's who walked in around 7:30-8:00 and just stepped over and around everyone to get to the rail. You were rude, inconsiderate and selfish. You stepped right in front of that couple and eventually pushed that young kid and his dad off the rail. Not cool. Also, the drunk guy yelling "brother" over and over trying to start a fight with the other guy towards the center. Not cool. You tried to cut your way towards the center of GA right before the show started. Didn't you realize those folks spent all day in line? And why continue to yell requests when Ed is in the middle of speaking about a current request he's getting ready to play or when he's having a serious moment? I know you were hammered, but come on. The aggressiveness was uncalled for. Rant over. Absolutely still on cloud 9. I traveled 4 states to see the show and I can say almost everything about that night was perfect. I have been a fan of PJ since 92 and a member of the fan club since 98! I am still trying to figure out why I was in the 10th row in section 103 behind 4 meatheads that spent the entire night texting pictures of them and Eddie to their friends. They could care less about PJ. Nice job Ten Club! Anyway, the night started with my favorite song and I knew it was going to be a great night. When they started Animal, I knew it was going to be VS. night! The crowd was amazing and the energy was incredible, I shook off the crappy seats and just enjoyed the show. A lot of people have talked about mixing up the setlist vs. playing a full record. I can tell you, I did not get to see them until 98 so I never had the chance to see some of there songs performed live even after seeing them live 10 times. 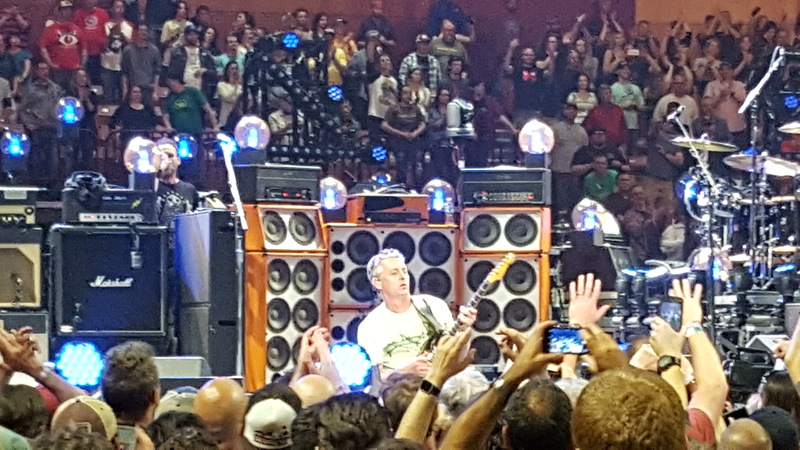 The crowd was really into it and I have never seen so much energy from the crowd as they plowed through VS. Eddie's voice was incredible and Mike is a show on his own. HE NEVER STOPS!!! The energy dropped when they started playing songs off of LB. But, I still enjoyed every moment of the show. Highlights were Indifference, Breath, Present Tense and Comfortably Numb. I was in Milwaukee for Yield and Greenville was so much better. I have seen the band since 98 and they just get better each time. 25 years and going strong!!!!!! Sad this is the only show this tour. Great picture from an amazing concert! We had a wonderful time in Greenville! Vs! Vs! 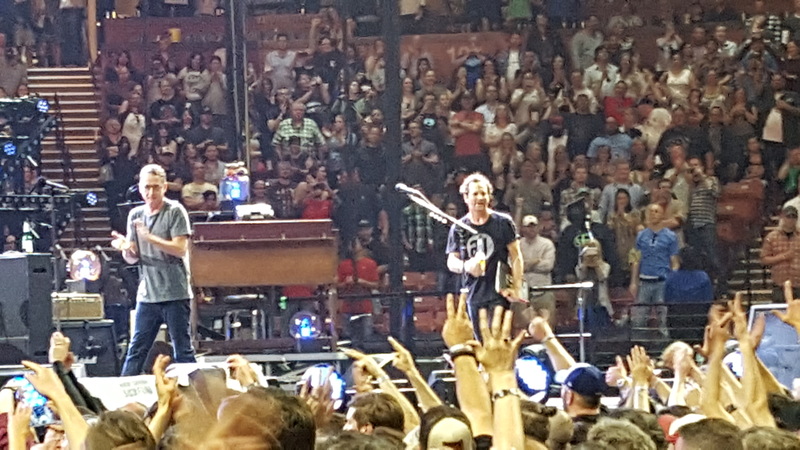 This was my first Pearl Jam show ever. Wow. I am speechless still. It was an incredible experience. I was literally so into the show, song by song and note to note, that when a new song started I just totally forgot what happened right before. So embarrassing. Anyway, when Jeff started hitting those stand up bass notes a light bulb went off above my head and the guy next to me (hello Neil if you're reading this) said "Did they just play Vs?" We just both looked at each other stunned, wondering the same thing: "Did that just happen and I was here to see it but somehow did not put the pieces together?!?!?!" We both looked down at our shoes in disgust and then I looked over at my wife and she was just laughing. She knew when I commented about Glorified G but chose to watch and wait for my slow brain to catch up. She's supposed to be the "married into this craziness" Pearl Jam fan too. For shame. Anyway, of course it was amazing in every aspect and way it could've been. The entire show. It just always is for me. I go in expecting for my life to change and soul to be cleansed. It always does and is. 36 hours total, from leaving to arriving back home, with a few hours of sleep in our car at the Traveler's Rest KOA. Now it's Tuesday and it still doesn't seem real. Can't really wrap my slow brain around it yet, not sure if I ever will. I just keep closing my eyes and seeing Mike running laps during Spin the Black Circle. The girl at the end of the show crying so hard after getting a tambo while Beth and I cried right along with her. Band members disappearing into the retro, almost 1994 size, looking pit and us following the spotlight until they popped out somewhere totally different like a Copperfield magic trick. My first Breath and Leash, along with the WMA to top them all. The whole freaking album right in my face while I was too blinded by tone and emotion to see it. The only way it could've gotten better was to meet a core group of PJ friends in person that I've only known online before Greenville. Joe (#50! ), Hank, Spence, Fyfe, Tanya and many others, plus to see Carolina again after STL 2014. That all happened too and at least I knew then it was happening instead of realizing after the fact. Such an amazing and eclectic group of people all coming together in Greenville. I guess I should be able to grasp this all but I just can't. Maybe by the time I'm in Lexington, but most likely when it all happens again in Wrigleyville. I just can't wait...I hope I'm as oblivious as I was in Greenville honestly. It's kind of nice now that I think about it, to be surprised by something you think you know so well because you wrap it around your entire life like a security blanket. Forgot to mention: stumbled into Bertolo's pizza for my only meal during my 10 hours in Greenville and it was really delicious. I'm out enjoying this beautiful spring weather and bbq'ing up some steaks and burgers for dinner and all I can think about is pizza. Best show I've ever attended by any band, and I go to a fair amount of concerts! Incredible energy from the band and crowd, amazing set list etc.! Vs. is my favorite album, so that was mind blowing. 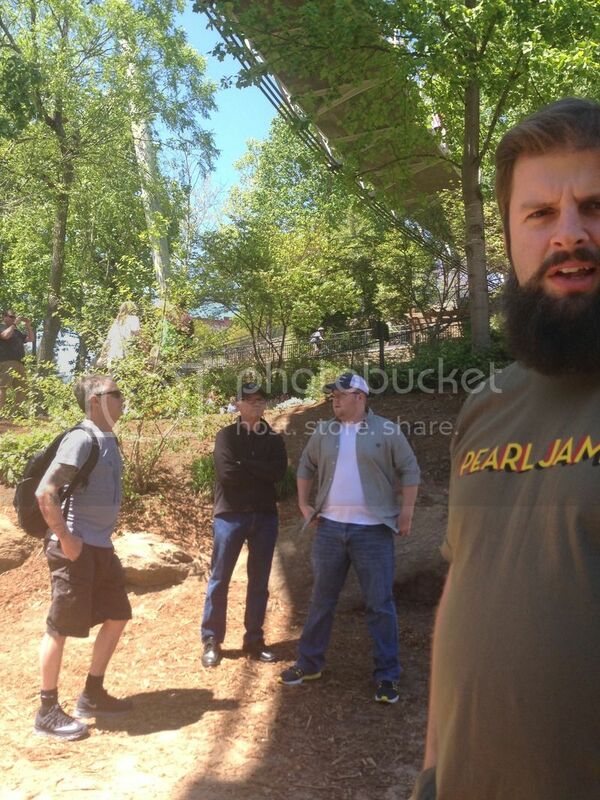 And to top it off, we ran into Mike in Falls Park the next morning and chatted for a couple of minutes. Incredible weekend! Must have ran into him right before or after the dude above. Is this you in the picture? Awesome! My wife and I saw you both. We were on Mike's side too. Happy for you both! I cannot wait to take my son some day!! Nope, but it was right around there! I was in a red Lightning Bolt shirt and was with my fiance who had a Labyrinth shirt with the 'Ello guy on it. We talked to him as he was walking up from the water after a chick ran up to us (after seeing my shirt) and telling us he was down there. He was super nice. I just thanked him for the show, told him it was the best I've seen, and that it was awesome since Vs. was my favorite album. He said it's something they rarely do and he enjoyed it, where as the other times they played albums he felt boxed in. I'm guessing you found him a bit earlier before he made it to the water, as after he talked to us he turned and went up the trail toward the bridge. Hey! 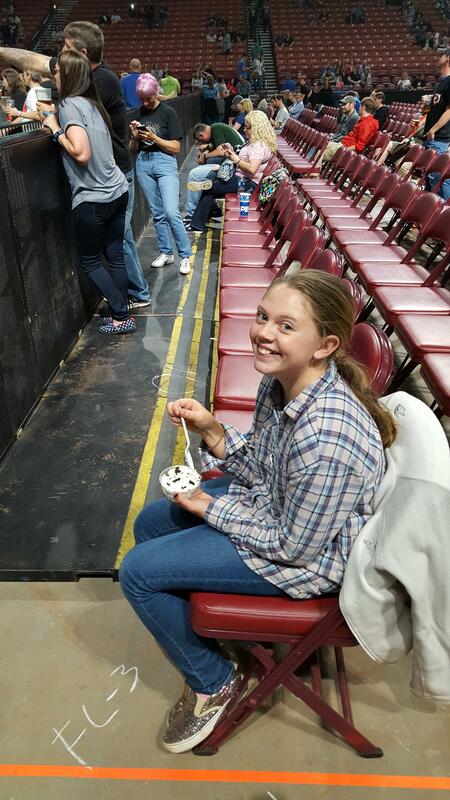 My buddy (his first show too) and I were in Row B, right behind you and your daughter. Congrats on the pic and thanks for being good concert neighbors. I hope we were not too obnoxious...chair drumming..."singing"...and the like. That was my wife telling you. We had just finished meeting Mike. I told her to stop telling people after you because I didn't want him to be blown out by people. She was excited for me and wanted to tell people. Moline, Milwaukee, and Greenville...incredibly fortunate to be at all three. Time to play Powerball? Although, I feel like I've already won. Amazing energy in the building on Sat. night. 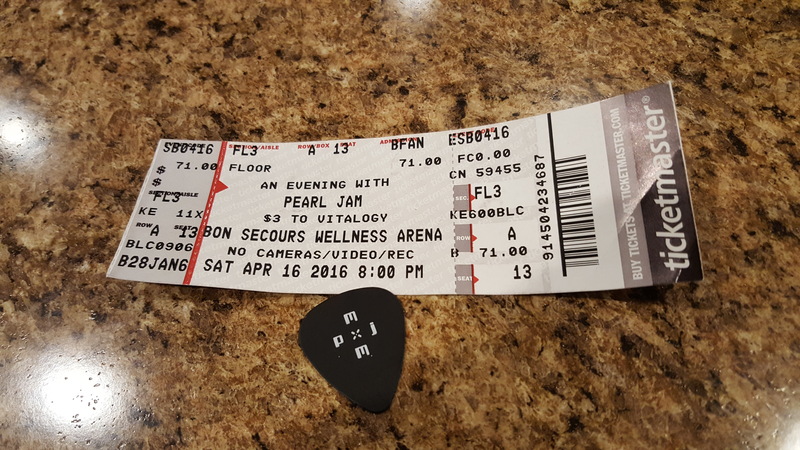 Thank you PJ for another unforgettable experience! Thanks to Ten Club for my first GA tickets! 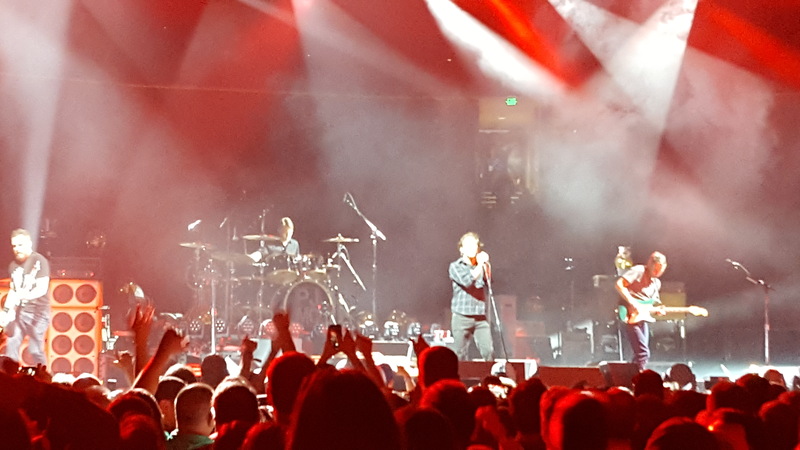 I hadn't seen the band since 2003 and this concert was an amazing, emotional ride for me. I never expected to get Vs. I have so many memories & experiences connected to that album. I was totally blown away. The band seemed to be having a great time on stage. Ed's voice is still awesome. The energy from the band & the crowd was electric. My heart melted when Eddie ventured out into the crowd & hugged the fan with the "Alive saved my life" sign. I met some really great folks at the show. The fans in the GA were great. Such an amazing night! I must have been pretty close to you, jmug23. I saw the 2 girls work their way to the rail. They started out behind me & as I listened to their typical drunk girl conversation, I was hoping that they would move because I was pretty sure I would end up wearing their beer before the night was over. Also saw the obnoxious dude trying to claim he was in the front. Kudos to security for handling the situation & taking care of the folks that had been in the front the whole time. It always amazes me how some people try to pull the "I'm looking for my friend/wife/husband" trick & worm their way to the front. anyone have a video of LEASH to share? I caught some of it on periscope and the crowd singing sounded great! Have you recovered from your PJ euphoria yet? Saw you on the big screens several times rockin out in g-ville. Congrats again on the bottle!!!! Wow! That's cool! I will never be the same again! Seriously though I'm still flying! I'm searching for people to tell the story to. My family has heard it all so many times they are starting to give me that glazed over, rolled eyes, patiently tolerant smile and nod look. "The bottle" has found a safe place in my dining room cabinet. My video shot at the end of Alive. Only regret is I forgot to turn my camera the right way. Worth the EV salute to us at the end and the memorable hug for the guy holding the "Alive" sign in the stands. thanks Eddie. Has to be the best version and performance of that song I can imagine hearing. Awesome! Give her our thanks as we likely would have missed him.